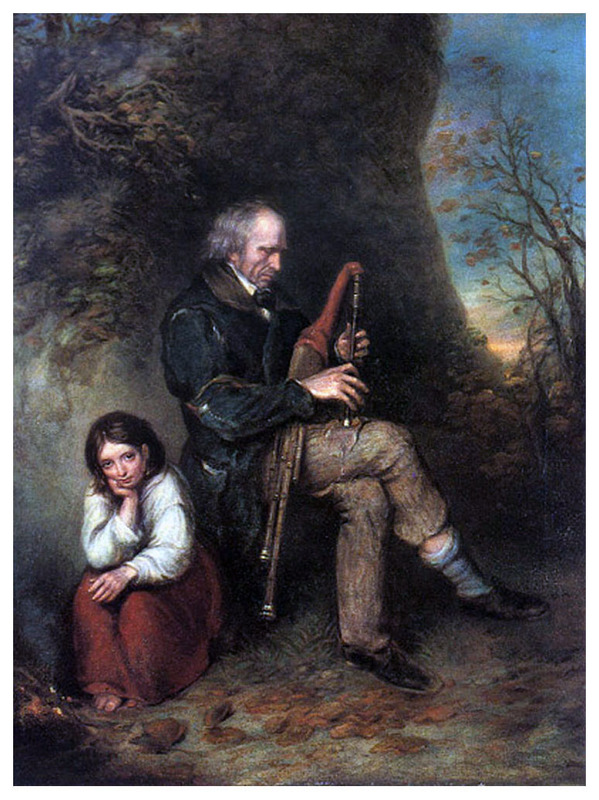 Who was Patrick O'Brien - The Blind Piper • People & Genealogy, Who was? Posted by Sharon Slater | Jun 2, 2014 | People & Genealogy, Who was? Patrick O’Brien was born in Labasheeda, Co. Clare to a prosperous farming family. He was well educated and fluent in Greek and Latin. By the age of 26 he was completely blind and like many blind people of his time took to music as his full time profession. 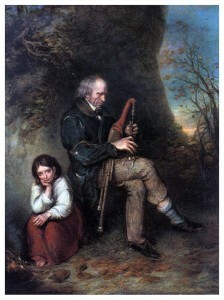 He played the uilleann pipe (also known as Union Pipe), which are a traditional Irish pipe “píobaí uilleann” (literally, “pipes of the elbow”), from their method of inflation. He moved to Limerick City where he attempted to make his name and although he would not become renowned on the professional circuit he would become well known as a street performer. His usual spot was on the corner of Hartstonge Street and George Street (O’Connell Street). He lived in the Englishtown area, in Pump Lane off Nicholas Street. He had two daughters, one of whom is supposedly immortalised in the painting by Joseph Haverty in 1844. The original is held in the National Gallery of Ireland. He slipped on ice in 1854 when he was 93 year old. During the following year, without being able to perform he became destitute and one of his daughter had to tend for him full time. She had to pawn many of her belongings to tend to him. There was a call out to assist her in the Limerick Chronicle Obituary at the time of Patrick’s death. He was buried in Kilquane, Parteen, Co. Clare in December 1855. On the 14 August 2017 a plaque was unveiled in Knockaphutten, Labasheeda, Co.Clare in memory of the Blind Piper.